O Superman launched Anderson’s recording career in 1980, rising to number two on the British pop charts and subsequently appearing on Big Science, the first of her seven albums on the Warner Brothers label. Town Hall in New York City in September 2001, and released in May 2002.
most current works. It continued to tour internationally from 2003 to 2005. As a visual artist, Anderson is represented by the Sean Kelly Gallery in New York where her exhibition, The Waters Reglitterized, opened in September 2005.
orchestra work Songs for A.E. premiered at Carnegie Hall in February 2000 performed by the American Composers Orchestra and later toured Europe with the Stuttgart Chamber Orchestra conducted by Dennis Russell Davies. Allen and David Liddle, in the exploration of new creative tools, including the Talking Stick. She created the introduction sequence for the first segment of the PBS special Art 21, a series about Art in the 21st century. Her awards include the 2001 Tenco Prize for Songwriting in San Remo, Italy and the 2001 Deutsche Schallplatten prize for Life On A String as well as grants from the Guggenheim Foundation and the National Endowment for the Arts. that created the opening ceremony for the 2004 Olympic Games in Athens. In 2006 she worked on a series of documented walks, a new album for Nonesuch Records, “Homeland”, and an accompanying touring performance. Anderson lives in New York City. 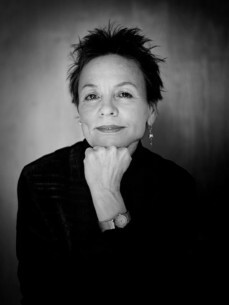 In February 2010, Laurie Anderson premiered a new theatrical work, entitled Delusion, at the Vancouver 2010 Olympic Games. This piece was commissioned by the Vancouver 2010 Cultural Olympiad and the Barbican Centre, London. Anderson was honored with the Women's Project Theater Woman of Achievement Award in March 2010. In May/June 2010, Anderson curated the Vivid Live festival in Sydney, Australia together with Lou Reed. Her new album Homeland was released on June 22. She performed "Only an Expert" on July 15, 2010 on the Late Show with David Letterman, and her song "Gravity's Angel" was featured on the Fox TV show So You Think You Can Dance the same day. She appears as a guest musician on several tracks from experimental jazz musician Colin Stetson's 2011 album New History Warfare Vol. 2: Judges. Anderson developed a theatrical work, entitled "Another Day in America". The first public showings of this work-in-progress took place in Calgary, Alberta in January 2012 as part of Theatre Junction GRAND's 2011–12 season and One Yellow Rabbit's annual arts festival, the High Performance Rodeo. Anderson was named the Inaugural Distinguished Artist-In-Residence at The Experimental Media and Performing Arts Center(EMPAC)at the Rensselaer Polytechnic Institute in Troy, New York in May 2012.